I do love it when my clients love what I do for them. Glowing feedback from my clients is what fires me up and keeps me going. So thanks May and Alfred for the kind words and for being such stars during our recent Engagement Session! I’m so glad we went for it when we did – the weather and light was A-MA-ZING! I hope you love your photos as much as I do. (P.S. 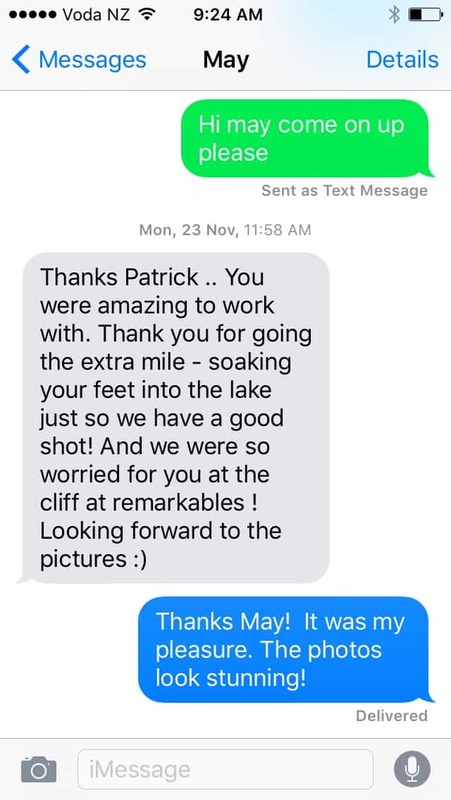 You might think from the text message below and the reference to “the cliff” that I was living rather dangerously during this shoot but in fact the truth was far from it! I guess to a lot of people from other parts of the world our mountainous terrain seems a lot more extreme than it does to us).